The legend of Robin Hood gets a curious and not entirely successful updating with Frank Sinatra's Robin and the 7 Hoods, with Sinatra taking the role of a 1930s gangster in Chicago -- at least an alternate-universe version sans Al Capone. 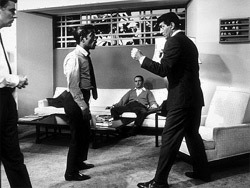 Sinatra plays a low-level gangster named Robbo, and his band of merry men (with usuals Dean Martin and Sammy Davis Jr., plus a cryptically cast Bing Crosby) battles the malicious big-time hood Guy Gisborne (Peter Falk, quite funny here). Things aren't going so well until Robbo comes across $50 grand he refuses to accept. He ends up donating the money to charity -- and suddenly, the legend of Robin Hood, who robs from the rich and gives to the poor, is born.